The University of Southern California has produced more NFL draft picks (502) than any team in college football. This illustrious program has 11 national championships, 7 Heisman award winners, 81 consensus All-Americans, and 43 College Football Hall of Fame inductees. The university has been the standard of excellence dating back to the school’s first national championship in 1928 to the more recent success of the Pete Carroll era of the early 2000’s. The University of Southern California has the advantage of recruiting elite athletes from one of the most prolific pipeline states in college football. The glamorous lifestyle of Los Angeles is an alluring recruitment tool that hooks young athletes searching for a better life. The Trojans field a competitive team every season, but these are the top 10 teams to ever play for the national powerhouse. The 1968 season was the year of O.J. ‘Juice’ Simpson. Juice touched the ball 409 of the 760 offensive plays this season and was awarded the Heisman Trophy for his efforts. He amassed 383 carries for 1,880 yards and 23 touchdowns. He also caught 26 passes for an additional 211 yards. He was an unstoppable force that went on to become one of the greatest running backs in NFL history. He was inducted into the College Football Hall of Fame 1983. Unfortunately, the Trojans only loss on the season came in the National Championship against the Ohio State Buckeyes. The ‘74 Trojans had an interesting season. The year opened with a 22-7 loss to the 20th ranked University of Arkansas. The Trojans then won 5 straight games by 11 or more points, and then inexplicably tied the University of California 15-15 at home. USC righted the ship and won their next 4 games by 24 or more points, including a 55-24 win against 5th ranked Notre Dame. The team defeated #3 Ohio State 18-17 to win the Rose Bowl and finish the season 2nd in the AP poll. Oklahoma was #1 in the AP poll, but they were on probation and could not compete in postseason play, so the Trojans were crowned National Champions. The team was led by 2 All-Americans in running back Anthony Davis, and linebacker Richard Wood. Anthony Davis 1,517 yards from scrimmage and 15 touchdowns. Richard Wood won his third All-American honors and was inducted into the College Football Hall of Fame in 2007. Anthony Davis was inducted in 2005. In 1978, the USC Trojans ground and pound offense led by Charles White had a 12-1 record and finished the season ranked number one in the coaches poll. The University of Alabama topped the AP poll with great controversy because Bama lost at home to USC in the third week of the season. Charles White was the catalyst to the success of the team as he accumulated 2,052 yards from scrimmage and 14 touchdowns. White would go on to win the Heisman Trophy the following year. The 1978 squad had two consensus All-Americans in running back Charles White and offensive lineman Pat Howell. The team also had Brad Budde and Anthony Munoz on the offensive line. Budde would be an All-American the following season and Munoz, who had an injury-plagued college career, would go on to become the greatest offensive lineman in NFL history. With talent like this on the team, it’s no wonder why they make the list. The 2002 season was Pete Carroll’s first successful season with the Trojans as the team went 11-2 and finished the season ranked 4th overall in the AP poll. The season got off to a shaky 3-2 start as they dropped early games against two top 25 teams. USC went on to win 8 straight games, outscoring opponents 332-163. They whipped the third-ranked Iowa Hawkeyes 38-17 to win the Orange Bowl. The team was led by Carson Palmer and Troy Polamalu who both strung together impressive college and professional careers. Carson Palmer threw for an impressive 3,942 yards for 33 touchdowns and 10 interceptions. His favorite target was freshman Mike Williams who caught 81 passes for 1,265 yards and 14 touchdowns. Palmer and Polamalu were both voted consensus All-Americans and were both selected in the first round of the NFL draft. In Pete Carroll’s third season with the Trojans he won his first National Championship with a team loaded with talent. Quarterback Matt Leinart led the team with 3,556 passing yards, 38 touchdowns and 9 interceptions for a well-rounded 164.5 passer rating. Lendale White was the team’s leading rusher, but it was freshman Reggie Bush who stole the spotlight with his ability to run and catch the ball. Mike Williams was Leinart’s leading receiver with 95 catches for 1,314 yards and 16 touchdowns. The ‘03 Trojans had an astounding offense, but it was their stout run defense that won them football games. Kenechi Udeze, Mike Williams, and Tackle Jacob Rodgers led the team and were consensus All-Americans. 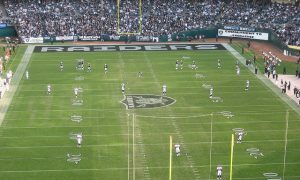 Udeze, along with defensive tackle Mike Patterson, defensive end Shaun Cody, and linebacker Lofa Tatupu all played well enough to be drafted in the first two rounds of the 2004 and 2005 drafts. This year, Matt Leinart became the first member of this team to make the College Football Hall of Fame, and I would expect more in the future. The 2008 Trojans are one of two teams on this list that don’t have a National Championship, or Heisman Trophy winner. They made this list, and rank highly, because of the level of talent on defense and the playmaking abilities of quarterback, Mark Sanchez. This elite defense allowed 7 points or less in 8 games, and record 3 shutouts. They beat the Washington schools by a stunning 125-0. The team suffered a difficult loss at Oregon State in week 3 that cost them their #1 rank that they were never able to reclaim. They beat Penn State in the Rose Bowl and finished the season #3 in the AP poll. Mark Sanchez managed to throw for 3,207 yards, 34 touchdowns, and 10 interceptions despite not having a single noteworthy receiver or running back to ease the load. The offensive line included freshmen Tyron Smith, and Matt Kalil who would soon make their names known. The team was led by All-Americans Rey Maualuga and Taylor Mays, along with Brian Cushing, Clay Matthews, and Everson Griffen. This team is stacked with talent that transitioned to the NFL, and for that reason, they make the list. Head coach John McKay ruled college football in the 1960’s to the mid 70’s, and the 1972 season is his crowning moment. His team won the National Championship, capping off an undefeated season in which he outscored opponents 467-134. The Trojans were packed with talent with four offensive linemen that went on to play in the NFL (Pete Adams, Allen Gallaher, Steve Riley, and Booker Brown), a College Football Hall of Fame running back (Anthony Davis), an NFL Hall of Fame receiver (Lynn Swann), and an All-American tight end (Charles Young). The Trojans used a running back by committee and pounded defenses play-after-play, running behind a great offensive line. The offense primarily used freshman running back Anthony Davis who accumulated 1,191 yards and 17 touchdowns which was second in the NCAA. He was backed by Sam Cunningham who rushed for 13 touchdowns. Using a ground and pound approach, USC controlled the clock and rarely left their defense exhausted on the field. On average, the defense gave up 240 yards a game and a little more than 1 touchdown. Their slow and steady approach dominated the league and earned them a National Championship and the number 4 spot on our list. The 1980 USC Trojans are the second team on this list without a National Championship or Heisman Trophy winner, but they did have 3 future NFL Hall of Famers on the roster, and Marcus Allen would go on to win the Heisman Trophy in the 1981 season. The notable names on this roster include Ronnie Lott, Marcus Allen, Bruce Matthews, Keith Van Horne, Dennis Smith, Roy Foster, Chip Banks, Joey Browner, and Don Mosebar who were all selected in the first round of the NFL draft. This team recorded an 8-2-1 season, which doesn’t sound impressive but the overall talent on the roster in undeniable. The Trojans dropped 2 of their last 3 games, but redeemed themselves in the final week of the season with a convincing 20-3 win over second-ranked Notre Dame Fighting Irish. Marcus Allen led the offense with 1,563 rushing yards and 15 touchdowns, while Ronnie Lott led the defense with 86 tackles and 8 interceptions. The very next season Marcus Allen would gain 2,683 all-purpose yards and 23 touchdowns, winning the Heisman Trophy. The 2005 USC team is one of the best offenses ever assembled at the college level. The team had 3 players with 1,000+ yards and 1 player with 986 yards. Running back Reggie Bush had the best year of his career and rushed for 1,740 yards and 16 touchdowns, while hauling in 37 passes for 478 yards and 2 touchdowns. He was backed up by Lendale White who had 1,521 all-purpose yards and a jaw dropping 26 touchdowns. This 1-2 combo couldn’t be stopped all season, but their efforts were not enough and the team lost to Vince Young’s Texas Longhorns team in the National Championship. Throughout the season Pete Carroll brutalized his competition by outscoring opponents 638-297. An eye popping 16 members of this team were drafted in the first three rounds of the NFL draft over the next three seasons, and Pete Carroll solidified his reputation as one of the greatest coaches at finding and developing young talent. The greatest University of Southern California team to ever take the field is Pete Carroll’s 2004 squad that included an undefeated National Championship, Heisman trophy winner, and 14 players who would go on to be selected in the NFL draft. The ‘04 Trojans were the preseason consensus #1 team and they did not disappoint. Carroll’s team outscored opponents 496-169, and decimated the Oklahoma Sooners 55-19 in the National Championship. 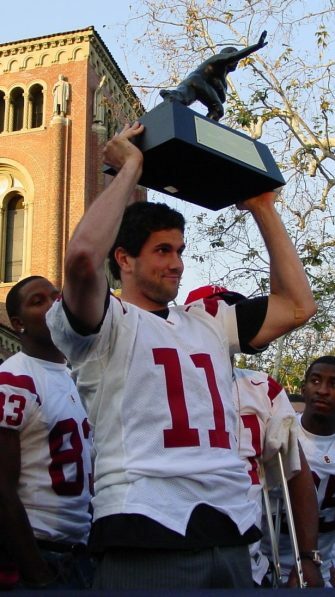 Matt Leinart’s 3,322 passing yards, 33 touchdowns, 6 interceptions and 156.5 passer rating was enough to earn the AP player of the Year Award, Manning Award, Walter Camp Player of the Year Award, and the Heisman Memorial Trophy. He was the consistent player the team could rely on, and he never failed to pull through in a close game. His leading receivers were Dwayne Jarrett and Steve Smith who combined for 1,509 yards and 19 touchdowns. The running game flourished with the deadliest 1-2 combo in college football with Reggie Bush and Lendale White who combined for 2,617 yards and 30 touchdowns. Reggie provided the speed and Lendale was the brawn who could barrel his way to a 5-yard gain with ease. They ran behind the powerful offensive line consisting of Winston Justice, Deuce Lutui, and Ryan Kalil – all 2nd round draft picks. The only thing Pete Carroll loves more than running the football is stopping the other team from running the football. 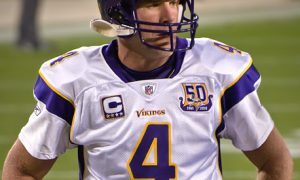 He assembled a core group of players consisting of Lofa Tatupu, Shaun Cody, Frostee Rucker, Mike Patterson, and Lawrence Jackson. This core group of players allowed an astonishingly low 280 yards per game, and just over 1 touchdown a game. This 2004 football team is not only the greatest USC football team of All-Time, but the greatest college football team of the decade. They are well-rounded on defense and score at will on offense. The flashy high-scoring offense would not take the foot off the pedal if they got a lead, and Carroll put the blame on the opposing team for not being able to stop them. They are the greatest team ever assembled at this historic university.